Looking for something different to do on a Sunday? Why not try the new Novello Alpaca Farm Tea Room! Fletcher and Jan Jamieson of Novello Alpacas on R62 and Judy Nichols have joined forces and have opened a Tea Garden at the farm which will be open every Sunday. They will also, by arrangement, conduct personal tours to the public. Novello Alpaca Farm specializes in creating felted fabrics and felt products. Felt is an intriguing process of transforming natural fleece into unique fabrics which have no warp and no weft like woven fabrics; does not fray, and is infinitely versatile. The products are unique items for the high-end fashion and interior design industries and are for sale in the small shop adjoining the Tea Room. Visitors can relax and enjoy lunch, or Tea / Coffee and light refreshments, in a beautiful setting while studying these fascinating animals and learning more about the unique experience of life on an Alpaca stud farm. 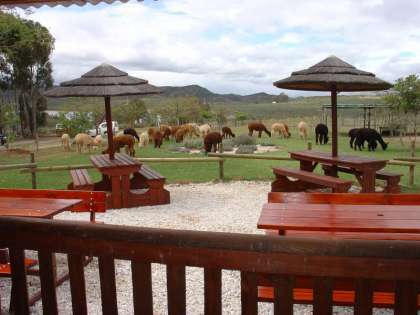 Novello Alpaca Farm and Tea Room is situated on the R62 between Montagu and Barrydale.